Home > Departments > Faculty > John Ameer Ed.D. John Pierre Ameer received his bachelor's degree from Yale University, specializing in Middle Eastern history, and Ed.M. and Ed. D. degrees from Harvard University, where he concentrated on the history of American education and on teaching in the context of diverse student populations. While at Harvard, he also served as director of the Teaching and Curriculum Program, one of the University's teacher preparation programs. For the last twenty years, Professor Ameer has taught in the education departments of Harvard, Simmons College, and Clark University. Prior to that, he spent nineteen years as a teacher and administrator in secondary schools in Connecticut, Texas, and California. His currrent research work is on secondary school reform in the United States, and on a continuing exploration of multicultural education. He has had articles and book chapters published on multicultural education, including A Mosaic of Multicultural Achievement (1991) for the Massachusetts Department of Education. 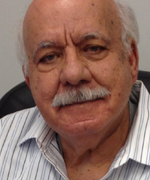 Professor Ameer's memoir, Assyrians in Yonkers: Reminiscences of a Community, was published in 2008 by Gorgias Press. In addition, two other books are in preparation; the first highlighting the effort of American missionaries to open schools in Iran during the 19th Century (an expansion of his doctoral thesis), and the second examining the use of films in elementary and secondary classrooms (an expansion of a teacher's guide that he wrote for McGraw-Hill, Instructor's Manual and Film/Video Guide).